Unpack the receiver, data cable and power supply. Locate the Radio Sync CD-ROM. Install the Radio Sync software from the CD-ROM, follow the menu to install ClockWatch>Radio Sync. Open the ClockWatch program. Open the WWV Setup screen (Options>WWV>Setup). Select the WWV Model (BS2) and select the number of the COM port where the receiver is installed. Open the WWV Test screen (Options>WWV>Test). Open the connection and observe the data coming from the receiver. Orient the receiver to give the greatest (highest) readability. Receiver will take approximately 1 to 3 hours to validate the time signal. 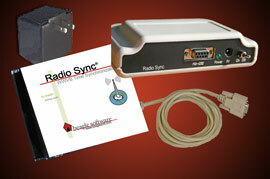 Time signal validation begins as soon as the receiver is powered and is done independently from the Radio Sync software. Set Radio Sync to use the WWVB receiver by Enable WWV as time source (Options>WWV). Set the interval (in minutes) how often Radio Sync will check time. Close the Options, Setup and Test screens. You can monitor the validation progress and time signal reception from the log window on the main screen of Radio Sync. While validating, the window will show the elapsed time the receiver has been turned on. After validation the window will show the time (in UTC) from the NIST. After Radio Sync verifies that the computer has been synchronized the ClockWatch Service can be started and run to keep the computer synchronized. This service runs whenever the computer is on and the Radio Sync application need only be run to change settings. The antenna/receiver unit is designed to be used indoors in a wood frame structure. Operation deep inside metal buildings or buildings with metal reinforcements may be marginal. The antenna/receiver should be mounted with the long side horizontal. It may be mounted either flat on a table or shelf, or hung vertically on a wall with the connectors on the bottom side. The antenna/receiver is directional with best reception obtained with the long side perpendicular to Fort Collins, Colorado. Orient the antenna/receiver for steady blinking of the power/signal LED. After final orientation secure receiver to prevent inadvertent movement (double sticky tape is OK). Note: Interference is diminished by the square of the distance (i.e., doubling the distance from the source will reduce its effect by 4). The recommended cable type is RS-232. 4-conductor telephone extension cabling may also be used. Avoid sharp bends in cabling and routing near AC or current carrying wiring. Table below lists the maximum permissible cable lengths for various protocols at various representative data rates. These lengths are as specified in the EIA RS232C, CCITT V.55 and RS422 interface standards. Conductor size and type: 24 AWG, twisted pair. conductors of each pair); 27.5 picofarads per foot (from each conductor to shield). Nominal DC resistance (each conductor): 24.0 ohms per 1000 feet. Nominal DC resistance (shield): 2.35 ohms per 1000 feet. Shield type: Overall braided with drain wire. At lower peripheral speeds of up to 9600 baud, the normal baud rate used in Radio Sync, serial interfaces can usually operate over cables up to 100 feet long. Use of special high quality cable may in some cases allow this limit to be extended to as much as 200 feet. Plug the data cable from the WWVB receiver into the computers serial port. The data cable has a female DB-9 connector at the end and plugs into an available serial port (usually named COM1 or COM2) on the computer. The external power supply keeps the receiver active during computer downtime and reboots. Re-validation of the time signal with the NIST begins as soon as the receiver is powered. To reset receiver and force a re-validation: remove power supply and RS-232 data connection from receiver, then reconnect.